Asteroid impact 2106: Reports of a space rock hitting us are exaggerated. 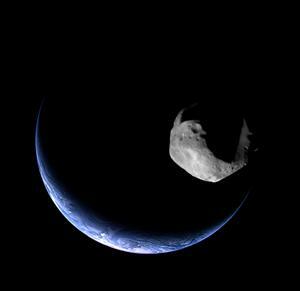 Artwork of a near-Earth asteroid based on actual images of the Earth and the asteroid Mathilde. On Friday of this week, a small asteroid about 50 meters across will miss the Earth by a mere 27,000 kilometers. 2012 DA14 was only discovered last year, but it didn’t take long to see that it would have a close, but definitely not too close, encounter with Earth this year. Ironically, within hours of posting an article about DA14 I got word from readers about another asteroid. An article is going around the web this rock is going to hit us…in the year 2106. The article, originally posted on The Voice of Russia and reposted on Space Daily, is a fascinating mix of fact and error. A lot of what it says is accurate, but the most important claim—that an asteroid will impact Earth in 2106—is simply wrong. I won’t mince words. The headline of the article, “We have 93 years left till the next End of the World: killer asteroid to hit Earth in 2106”, is appalling. It’s fear-mongering, plain and simple, because it’s totally wrong. So let me be clear, where the article is not: The asteroid in question is real, and it does sometimes approach the Earth, but the odds of an impact in 2106 are so small that they are indistinguishable from zero. In other words, rest easy. Or more accurately, don’t worry about the fate of your grandchildren just yet. Here’s the deal. Orbital simulation for asteroid 2012 YQ1. The asteroid is called 2012 YQ1, and it was discovered (as you might tell from its name) in 2012. Its size isn’t well known, but it’s probably in the 100-200 meter range, bigger than an American football field. It travels around the Sun on a highly elliptical orbit, taking just under three years to orbit once. Its orbit stretches from the inner solar system, between the orbits of Venus and Earth, out to as far as halfway to Jupiter. YQ1’s orbit is tilted a bit with respect to ours, but the geometry lines up in such a way that once per revolution the asteroid has the potential of approaching pretty close to Earth. It last passed us in January 2013, staying a comfortable 15 million km (9 million miles) away—a huge margin, 35 times the distance to the Moon. No big deal. All well and good. But, according to the article in Voice of Russia, when it was discovered the astronomers projected the orbit well into the future, and found it will impact Earth in January 2106. Aiiiieee! Are we all doomed? No. The claims of an impact are at best exaggerated. When the asteroid was found, only a handful of observations of it were made, and only using a single telescope. This is fine for a discovery announcement, and even if you want to predict the position of the asteroid for a few days or weeks, so other astronomers can follow up and observe it themselves. But trying to project the orbit of an asteroid like this too far in the future starts getting difficult. Any small uncertainty in the initial measurements get amplified as you project the position into the future, making its predicted location murkier and murkier. Eventually, it gets so fuzzy you can’t make any claims at all. The only way to catch it would be to keep your eyes on it, observe it as long as possible until you can be completely sure of where its headed. The same is true for asteroids. Observing one for a few days is not nearly enough to be able to get accurate predictions for a century in advance. You have to observe it over a longer period of time and nail down those uncertainties if you want to have any hope of knowing where it is in the future. Even after a year you probably won’t have enough observations to make long-term predictions. Claiming an asteroid will impact us in 96 years after observing it for a week is, quite simply, impossible. The best you can do is determine the probability of an impact. Back to the baseball analogy, imagine you could only guess the ball’s direction to within a few degrees after it left the bat. At that distance, that small uncertainty in direction adds up to a lot of uncertainty in its position when it reaches you. You could be off by ten meters or more to the left or right, in or out. That’s a big area. How much of that area is covered by your mitt? Not much. Your odds of catching the ball by chance are maybe one in a thousand. Again, it’s the same with an asteroid. A slight uncertainty made using only a few observations turns into a huge volume of space it could be in a century later. The odds of impact become vanishingly small, millions to one against. So I call shenanigans on that claim it will impact in 2106. There is literally no way that prediction can be reasonably made. The asteroid Apophis taught us a good lesson. When it was discovered there was a 1-in-500 chance it would hit us in 2036! But as observations continued, the orbit was refined, and in January the possibility of a 2036 impact was entirely ruled out. That’s the way these usually work. I’ll note that Voice of Russia article also talks about Apophis still being able to potentially hit us. That info is a month out of date. The article also says YQ1 is on NASA’s “virtual impactor” list, but in fact it’s not listed on either NEODyS or JPL’s Sentry. Having said all that, I’ll add that we can’t say for sure YQ1 won’t hit us. Without more observations we can’t say either way, just that no impact is the far, far more likely scenario. That’s why we keep watching the sky, keep looking for new asteroids as well as following up on known ones. It’s nice to be able to rule out an impact at a given time for a given rock, but it would also be extremely helpful to know if one really is going to hit us. I think that would provide excellent motivation to do something about it.